Join your colleagues for an evening of art and science in the historical center of Dubrovnik, St. John’s Fortress, at the aquarium of the Institute of Coastal and Marine Research. There, after passing through the stupendous atrium, one enters the fascinating underwater world of silence and tranquil atmosphere. The sea animals include eels, starfish, scorpion fish, seahorses and many more. Kind and well instructed staff will be at your disposal and assistance all the time, welcoming you in this unique sea aquarium and the beautiful city of Dubrovnik. Enjoy the old Dubrovnik history, architecture, aquarium, science and art. Entrance to the whole aquarium is free for all attendees and refreshments will be provided. 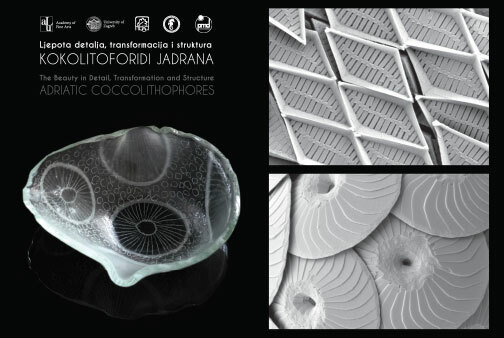 The exhibition “The Beauty in Detail, Transformation and Structure – Adriatic Coccolithophores”, organised by the Academy of Fine Arts, University of Zagreb, and the Croatian Botanical Society is a synergy between science and art that brings together scientists and artists, professors and students, modern technology and various artistic techniques. The scanning electron microphotographs of coccolithophorids that will be exhibited were taken from samples collected in a study which was carried out in the winter and summer of 2013 in the Šibenik aquatorium and the River Krka Estuary, eastern Adriatic Sea. The research is a co-operation between the Uppsala University, University of Oslo, Faculty of Science University of Zagreb and Rudjer Bošković Institute. Coccolithophorids were collected by a filtration method and recorded using a scanning electron microscope at magnification of up to 10,000 times. These microphotographs and satellite images of phytoplankton blooms were the inspiration for Academy of Fine Arts University of Zagreb students in the art techniques of painting, sculpture, graphic and glass. With the synergy of art and science, scientists are given the opportunity to reveal the beauty in details invisible to the human eye, while the artists get the opportunity to see the dimension of life manifested in the perfection of natural forms and structures. It was observation of the natural environment that gave rise to the first impulse for the development of arts and creativity. The coccolithophorids presented in this exhibition have once again shown some of the magnificent natural structures that fundamentally influence the development of artistic expression. Underlying our familiar world are hidden some extraordinary microstructures that science has revealed and here become the inspiration for new tendencies in experimental kinetic art, basic elements of the visual arts, constructive art and much more that are part of the legacy of 20th century. These art works, as well as microphotographs and satellite images will be exhibited in Aquarium of the Institute of Marine and Coastal Research, University of Dubrovnik. DIRECTIONS. The old city is easy to reach by public transportation (http://www.libertasdubrovnik.hr/mreza-linija) with buses no 5 and no 6.